Be the first to share your favorite memory, photo or story of Denver. This memorial page is dedicated for family, friends and future generations to celebrate the life of their loved one. 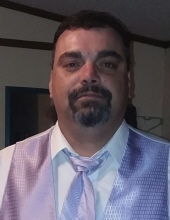 Denver Lee Hunt, 42 years of age of Richlands, VA, passed away Sunday, January 20, 2019 at Clinch Valley Medical Center from a sudden illness. Born January 6, 1977 in Grundy, VA, he was the son of Lillian Hunt Vansant, VA.
Denver was an avid outdoorsman who enjoyed four wheeling, mudding and fishing. He was of the Church Of Christ Faith, a loving son, father, grandfather and friend. He was preceded in death by his grandfather Ellis Hunt, Sr. Survivors in addition to his mother Lillian Hunt of Vansant, VA, include his fiancé Jeanette Marie Hunt of Richlands, VA; daughter Hannah Elizabeth Hunt of Vansant, VA; step-daughter Ashley McCall and husband Brian of Kingsport, TN; Goddaughter Kiara Charlene Marie Keen of Richlands, VA; son Kamron Reece Hunt of Grundy, VA; step-son Brandon Puckett of Richlands, VA; grandmother Gladys Hunt of Hurley, VA; sister Teresa Mullins and husband Charlie of Spartsburg, SC; grandson Braxton Puckett. He is also survived by his friend who was like a brother: Teddy McClanahan of Richlands, VA; special friends Brian and Audrey Keen of Richlands, VA; uncles Russell Hunt of Grundy, VA, Ellis Hunt, Jr., of Vansant, VA, David Hunt of Hurley, VA; aunts Mary Sue Thomas and husband Herman of Rochester Hill, MI; several nieces, nephews and friends. Funeral service for Denver Lee Hunt will be held at the Shortridge-Ramey Funeral Home Chapel of Grundy, VA, Wednesday, January 23, 2019 at 12:00 noon with Elder Danny Hurley officiating. Burial will follow in the Greenhills Memory Gardens in Claypool Hill, VA. Active pallbearers will be Brian McCall, Teddy McClanahan, Brandon Puckett, Shannon Mullins, Brian Keen, Russell Hunt, Charlie Mullins and Kevin Matney. The family requests in lieu of flowers, memorial donations can be made to the funeral home. The family will receive friends at the Shortridge-Ramey Funeral Home Chapel of Grundy, VA, Tuesday, January 22nd after 6:00 p.m. with evening service to be held at 7:00 p.m. The family of Denver Lee Hunt have entrusted the care of their loved one to Shortridge-Ramey Funeral Home of Grundy, VA.
"Email Address" would like to share the life celebration of Denver Lee Hunt. Click on the "link" to go to share a favorite memory or leave a condolence message for the family.